Since today as I write it’s snowing like crazy here, I decided it was time to return to my recently-developed interest in photographing buildings. Staircases in particular. For example, on a recent field trip to photograph churches in Baltimore, one of the most interesting shots I came across was this one. 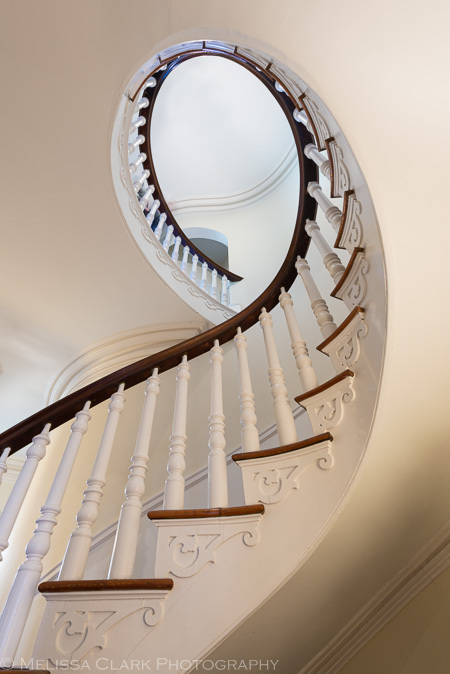 Staircases can be beautifully curved and wooden, like this one. But it was on my trip to San Francisco this summer that I first had a chance to see and photograph staircases to my heart’s content. Before my trip, I researched architectural sights I shouldn’t miss, and thanks to Thomas Hawks’s website, came across lots of inspiration. Some were in public view, others required a bit of fancy footwork to see and photograph. I’ve turned some of these images into notecards, fascinated by the shapes and tonalities (makes a change from the garden notecards I usually print, as well). I hope to return this coming year, maybe even with a tripod. A black and white rendition of the staircase at the Mechanics Library, looking up from about the second landing. From the top down, in color, and cropped to eliminate a distracting sign at the bottom of the stairwell. A view of one of the staircases at San Francisco’s main library, near City Hall. I stumbled on this set of stairs in the interior of another wing of the library, hidden away from the main rooms. I loved it. Converted to black and white, but it didn’t take much. 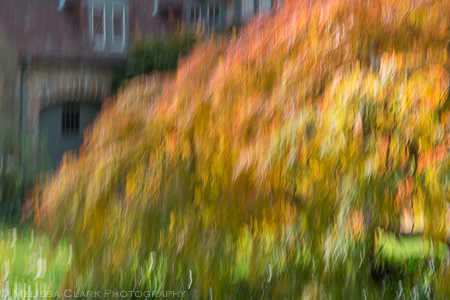 Fall impressions in my neighborhood. A new year stretches ahead. I’ve shifted gears again. In late December, I left my position as a landscape designer at Landscape Projects, where I’d worked for almost twelve years. Taking early retirement has been a dream for a long time, and suddenly here I am. Now I will work as a part-time marketing consultant to my old firm and some designer colleagues who want a little help with media sites. But mostly I will be a photographer, of gardens and other subjects. This blog has helped me sell photos, now and again. In 2013, I sold images to White Flower Farms (have you gotten the spring catalog yet? Look on page 57 and 132 for photos of Hosta ‘Elegans’ and Dutchman’s Pipe), Phaidon Press (a half-page image of Opus 41 in New York for their tome Art & Place, and some landscape architects across the country. Another image sale for the cover of a book on California gardening is in the works. This year I hope to work with at least three or four landscape designers to photograph their work for their websites, Houzz sites, or whatever else is needed. But what I’m most excited about is the chance to stretch myself as a photographer by trying new techniques and visiting new places. Cuba is on my itinerary for February – so I’ll have to overcome my reticence about photographing people I don’t know. I chose the trip because of my love of photographing architecture and colorful street scenes, like I was able to capture in Mexico in 2009. Stay tuned for a report and photos when I return. 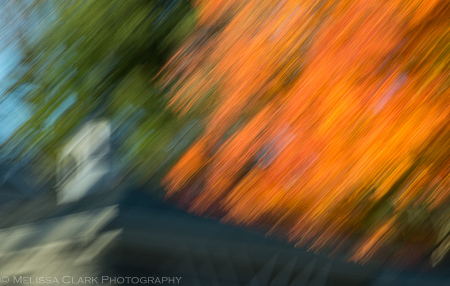 In the meantime, I want to share a couple of images inspired by a fellow photographer (a real pro) named Sarah Salomon, who specializes in “motion” images. 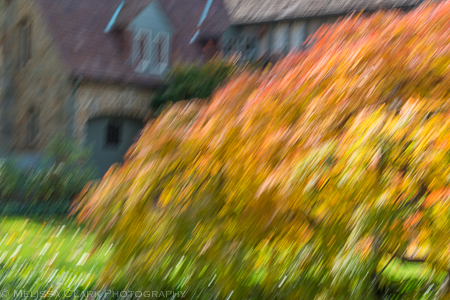 First, here’s the “straight shot” – of a gorgeous Japanese maple I happened upon one day while out visiting a client. 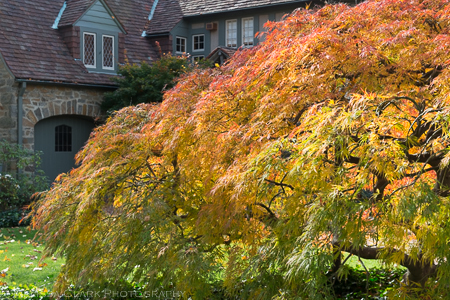 An enormous dissected Japanese maple in front of a house in northwest DC. My first attempt – a bit shimmery but not quite what I felt I was after. I also didn’t like the little white streaks marching along the bottom edge of the image. And I wanted more of the house visible on the left, as an anchor. That’s better. Tweaked a bit in Lightroom and Photoshop. The white streaks are still there but don’t bother me as much for some reason. Since then, I’ve experimented more with this technique, discovering along the way that for every “keeper,” there are many, many shots I delete (thank God we’re in the digital age, I can’t imagine doing this with film). 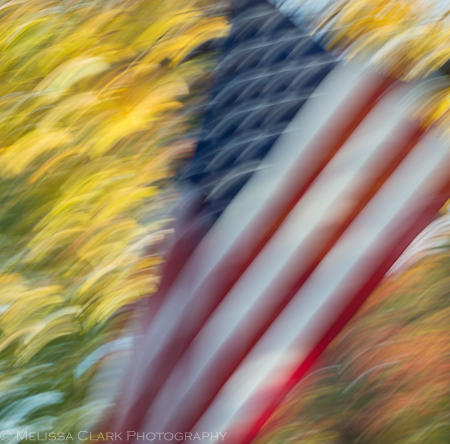 And on Veterans’ Day, on my way to the office, I stopped in a mundane residential neighborhood and took this, which I quite like. At Sarah’s suggestion, I desaturated the yellows so they wouldn’t overwhelm the rest of the image. So, head’s up that the coming year’s posts may be a bit different than before. Although gardens will always be my first love, I’ll be traveling down some new roads. Five years plus after my first post (December 2007), maybe that’s not such a bad idea.